This swap is now hosted in Instagram, but it started on Flickr. I sat out a few rounds, but really missed it so for Round 7, I got back in. My partner likes color so this is the mug rug I made for her. 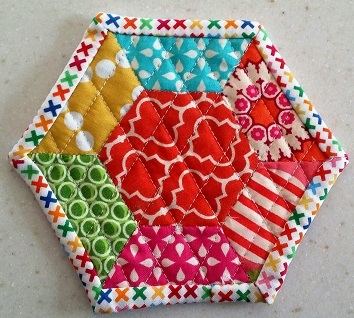 What possessed me to think I could do a hexagon shaped mug rug, I don't know. I wanted it to be unique this allowed me some practice with binding corners. My partner sent a little late so I got a nice surprise the other day as my package came in. 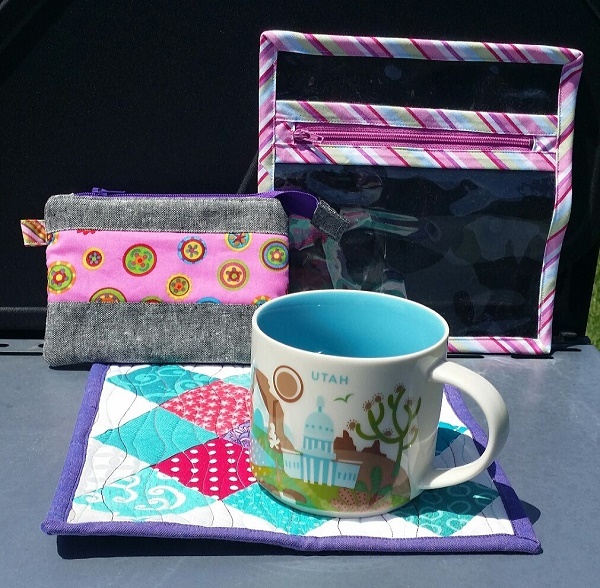 She made me not only a mug rug, but also a zip pouch and a clear pouch too. The mug she sent was Utah, which I need for my ever growing You are Here Collection. I love this swap and Yvonne over at @quiltydream is a wonderful hostess.